If you want to grab a quick, cheap local meal, Boulder has many options. The following are all locally owned and operated businesses which have become Boulder classics. Born in Boulder in 1995, Illegal Pete's is a favorite spot for stuffed burritos and other Mexican fare. Place your order and watch it move down the assembly line before your eyes. The Illegal Pete's staff click like clockwork; Henry Ford himself would marvel at the efficency of it all. Grab a beer with your meal if you'd like. The patio in front affords a nice view of Pearl Street walking traffic. Favorite haunts of rock climbers, the twins Mountain Sun and Southern Sun are brewpubs with a selection of sandwiches, salads, wraps, and chili. Although the food is great, the beer is even better. Try a Raspberry Wheat in the summer heat or their Imperial Stout after a long cold hike. Also try the carrot cake — it's a little-known secret. For a fun time, borrow one of the community board games while you sit and eat. Scrabble and nachos never went so great together. Breadworks is an incomplete name; this place could also be called Soupworks or Dessertworks. The soup-and-bread combo will remind you of grandma's home cooking — and it won't break your budget. Vegetarians and those with food allergies will appreciate the fact that ingredients are listed clearly. On cold winter days at lunchtime, you'll find this place stuffed with locals. In 1989, the first Nick-N-Willy's pizza place opened in Boulder. Almost twenty years later, Nick-N-Willy's have spread all over the country. However, Boulder locals still love the old shop. You can eat a slice of pizza at the tables out front — or pre-order a whole pie to bake at home. For another Boulder pizza experience, try Abo's New York style (1110 13th Street or 637 South Broadway). 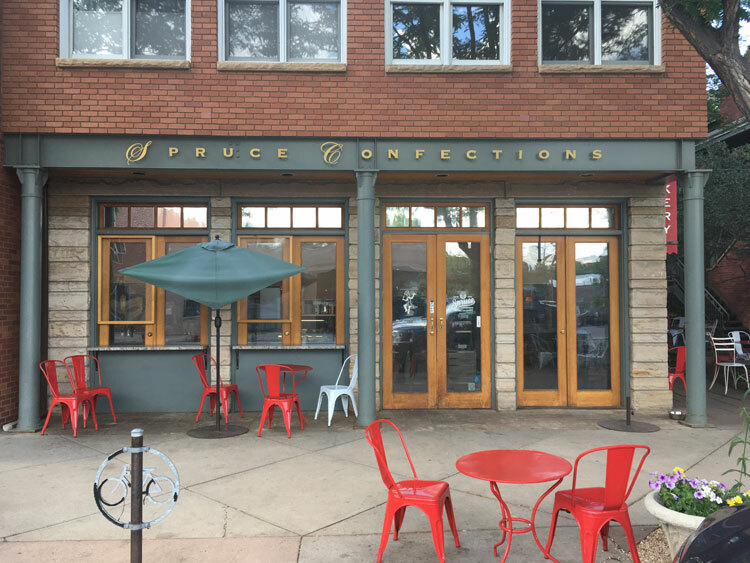 This hidden gem on West Pearl street offers a tasty selection of baked goods and fresh soups, along with specialty coffee drinks. The sidewalk patio is a treat, and the south-facing location means that you can lounge in the winter sun. Cyclists, students, and entrepreneurs mingle on warm weekend mornings. Friendly staff and a great view of tree-lined West Pearl seals the deal on this spot.